Cute Apartment in the heart of Montepulciano but yet in a quiet street. 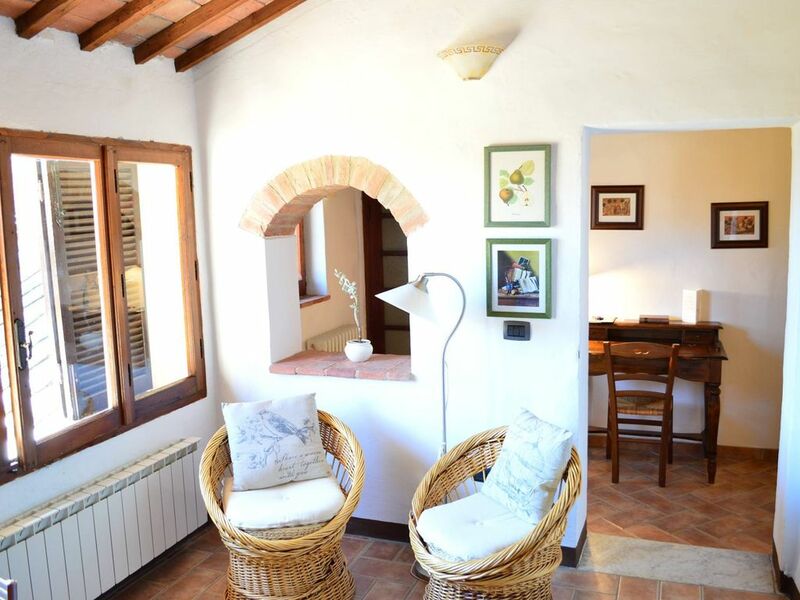 This cute apartment is located in the core of Montepulciano at few steps far from the main square, the old theater and the main old street, but yet placed in a parallel and quiet one. This 45 square meters first floor apartment has a bedroom, living room with full equipped kitchen, corridor with desk and a toilet. Upon request, also the inter-connectable ground floor apartment can be rented for additional persons and children. The Little Arch of Memory is full of good historical memories of the past and of of my family (when a child I was using jumping directly on the roofs from the main window and walking on it to go directly in the houses of my friends...)The large window in the living room offers partial view on the historical roofs, mountains and lake. The apartment is mixed with Tuscan and relatively modern style. Yet the ceiling offers beautiful oak-beamed style. The little arch was made several centuries ago and function is not yet explained but it copies all of the other larger arches in the downstairs wine cellar that was also used as bakery until about 100 years ago. Indeed, the antique brick made oven is still visible in the wine cellar. Very close to all of the historical attractions, wine cellars, monuments and theather. My Mother is the present owner but I help her with communication and using internet. The house was purchased by my grandparents just after the second world war when they started a small grocery activity in the main old street. It was where my grandparents lived and my mother grew up and me spent the childhood....It is well located, at few steps from all of the main attractions i the historical part of Montepulciano but yet in a queit area. In the deep core of the historic part of Montepulciano. Few steps from the main square, old theater and the main historical street full of restaurants, art and wine shops-cellars, yet the apartment is placed in a quiet street. There is one lavabo, WC, bidet and nice shower. Despite almost never hot in Montepulciano (little mountain), there is a very efficient A/C in case of need to be used with moderation . Safe Free public at about 50-150 meters. Full refrigerator with freezer too. Nice comfortable apartment, convenient to everything. Elias's apartment was clean, comfortable, and had everything we could ask for. It is conveniently close to the sights and shops of Montepulciano. Elias was very helpful to us. There is a an excellent restaurant, Osteria del Conte, very close to Elias's property. Lovely apartment near the cathedral and central square, with remarkable restaurants and wine nearby. Wonderful location, host was so helpful and informative. Would definitely stay here again!! Wonderful location, host was so helpful and informative. It was a tad warm at night for sleep but would definitely stay here again!! Many thanks for your beautiful review! Yes, indeed it was hot and you could use the aircon that is indeed for when it is hot. Great location for exploring Montepulciano and the surrounding countryside. Elias met us at the Parking lot and helped us get settled into the apt. He had good recommendations for restaurants and wine tastings. Montepulciano is the perfect place to stay and appreciate Tuscany. The town is small enough to explore in one day but has enough to offer to keep you busy for several days. Beautiful panoramic views, sunrises and sunsets. Nice kitchen and a store nearby so we could fix coffee and some meals at the apt. and save $$. Thanks a lot! You have been very nice guests! Perfection in the heart of Montepulciano! I was fortunate enough to stay in Elias' apartment (12.5.2018 - 19.5.2018) while in Tuscany on a cycling vacation and it was absolutely perfect. The apartment is steps from the Piazza Grande on a quiet and peaceful side street. The apartment was very, very clean, with a bedroom, bathroom, kitchen with sitting area and hallway with desk. The kitchen is stocked with glassware and utensils and, most importantly, a wine opener. It is the perfect place for a person or a couple. Elias is a wonderful host! He met me at the apartment with cantucci and homemade limoncello, which was just what I needed after a long trek to Italy. I am looking forward to my next trip to Italy and will certainly call on Elias to rent this apartment again! Ciao! Many thanks Michael and it has been a pleasure hosting you and meeting you at the bar for a drink together! The apartment is few step far from the main old street full of high quality art and leather shops and antique wine cellars wherein wine was already stored more than 2000 years ago from Etruscan people. A wonderful antique theater is placed at only 20-30 meters far (30 seconds). Also, all of the main museums and historical building are within 1-10 minutes walking.